Pro Data Doctor provides a wide-ranging data eraser utility that completely wipes the records of entire hard disk or removable media supported on FAT/NTFS file system based windows operating system. Secure data wiper allows you to permanently removes offline/online internet activities (like History, Cookies, IE temporary files etc) and securely cleans system files and application files for the computer privacy. Data Doctor’s disk wiping tool facilitates with Destructive and Non-Destructive mode for complete data deletion. Non-Destructive wiping wipes deleted files and folders while on the other hand Destructive mode removes data (saved or unsaved data) from selected sector range or entire hard disk. Highly interactive GUI wizard makes it easy to get rid of unwanted information for the system performance. Wipe selected data permanently on your disk drive. Wiping utility completely wipes data in destructive and non-destructive mode. In Non-destructive mode tool completely deletes unused disk space, application files, system files and temporary internet files. 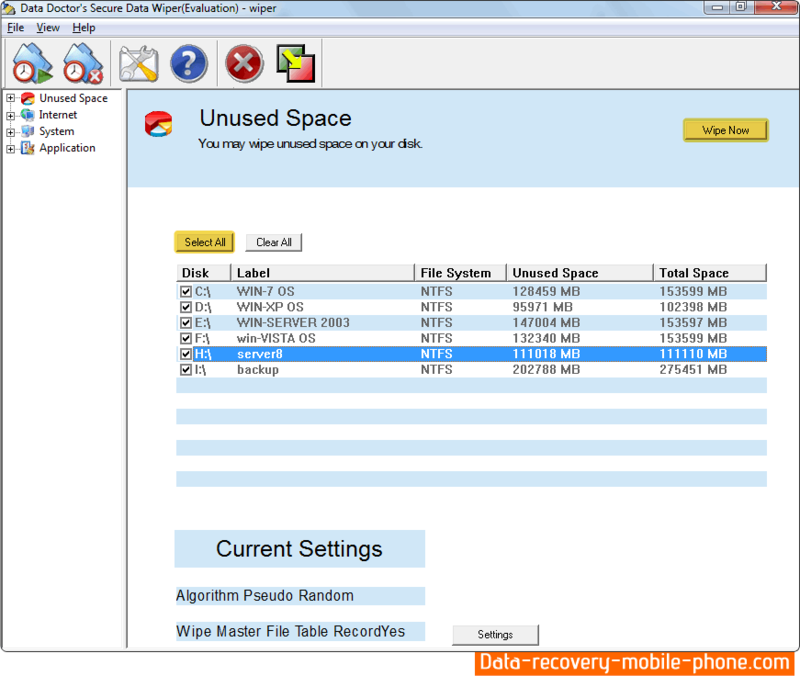 In Destructive mode existing or non-existing data completely wipes by selecting entire disk, sector range or sectors in partition option. Provide facility to the user for switching from Non-destructive to Destructive wiping mode for advance data cleanup. Clean deleted internet history like cookies, chat history, typed URL, search history and other more information for your privacy. Software completely erases files and folders directly from context menu. Wiping algorithm creates wipe list and runs them periodically. All available wiping options in Destructive mode of Data Doctor’s secure data wiper wipes disk sector of selected disk area regardless of data saved in that sector range. Please be careful while selecting the Destructive wiping option.